Data is from the September 2015 The Marketing Institute of Ireland (MII) and 256 Media report titled "What's the Story? 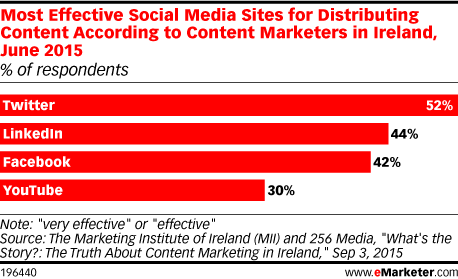 : The Truth About Content Marketing in Ireland." 73 respondents in Ireland were surveyed online during February-June 2015. The vast majority worked in marketing. Of the respondents, 20% worked at companies with less than 10 employees and 46% worked at companies with 100-1,000+ employees. Survey questions were modeled on previous research conducted in Australia, the UK and the US by Content Marketing Institute (CMI). The Marketing Institute of Ireland (MII) is a professional body for marketers in Ireland and 256 Media is a content marketing agency based in Ireland.